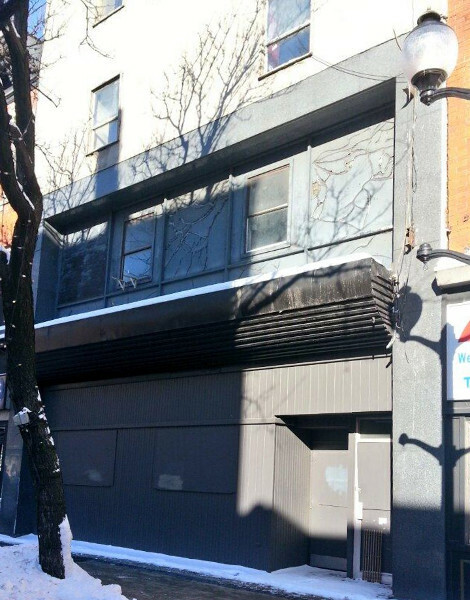 An article posted Friday on CBC Hamilton reports that the International Village BIA wants the city to demolish the site of the former Sandbar Tavern at 193 King Street East between Walnut and Mary Street. The Province shut down the notorious bar in 2006 and seized the property, later handing it over to the City of Hamilton. The building has sat empty ever since. The BIA says they have run out of patience and just want the city to "do something" with the property, while members of the Beasley Neighbourhood Association say they want the site turned into green space. Ward 2 Councillor Jason Farr says he has asked city staff to look into the feasibility of adaptive reuse for the four-storey building or, failing that, of tearing the building down to make room for a parkette. I can understand the frustration and impatience of the BIA members and Beasley residents, but demolishing the building and putting a parkette in its place is just about the worst possible outcome. It would break the consistency of the Victorian streetwall on King and waste a prime retail location on what should be one of the city's best retail centres. It would squander the embedded materials and energy in a four-storey building, materials and energy that should instead by recovered and put back into productive use through investment into restoration and adaptive reuse. It would squander the opportunity to increase the density of people and uses in the downtown core and to increase the city's property tax assessments. Right after Council voted unanimously to protect the streetwall at 18-28 King Street East from demolition, it would also send a dangerous message to property owners that the city is not willing to practice what it preaches. Finally, to see the futility of this gesture as a call for "greenspace", we need only look at the nearby parkette on King William Street just west of Hughson Street, which some wag has labeled "Demolition Park" on Google Maps: a desolate, pathetic sliver of pavers and weeds flanked sharply by the tall, windowless exterior walls of the adjacent buildings. This will not be a park. It will not help to meet Beasley's desire for more greenspace. It will merely be yet another flat rectangle in a downtown already riddled with them. When Toronto Chief Planner Jennifer Keesmaat spoke in Hamilton earlier this month, she left us with the following advice: "Be bold. You have to be bold and choosy. You have to set very high standards and don't settle." I know the BIA and Beasley are running out of patience (Keesmaat also advised, "Don't be patient. "), but to argue that the City should demolish the building is merely to settle. Far, far too much of the downtown's precious built heritage has already fallen to neglect, negligence, impatience and misplaced hope. We deserve better. The International Village BIA deserves better. Beasley Neighbourhood deserves better. Instead of settling, let's be bold. Let's be choosy. Let's set very high standards. Let's make the restoration of one of downtown Hamilton's most notorious properties a showcase for adaptive reuse, for reinvigorating old buildings with new energy, and for leading by example. The property was apparently abandoned by Hamilton Realty Capital Corporation around two years ago, focusing instead on the Cannon Knitting Mills. Adam Sabbag, part owner of Aarets Jewellers two doors down from the Sandbar, said he “won’t get excited” until a new owner makes an obvious effort to fix up the dilapidated, boarded-up building. “The big improvement was getting rid of the Sandbar,” he said. If police decide against using 193 King St. E., Norton believes the city can still auction it off as surplus, perhaps for retail use. Parkette seems to be code for: We have no idea what to do with this space. That plan was killed by Public Health moving to the 'Education Square' proposal back in the day, which then turned into the scaled down McMaster Downtown Campus with public health ending up??? I think in the Right House? Lister? If anyone knows for sure where public health is ending up after all is said done, pass it on. But to propose demolishing a piece of this streetwall for an ugly parkette makes no sense IMO. HRCC seems to be unable to conceive of a repurposing that doesn't involve long-term public sector investment (Knitting Mills was much the same formulation, which is to say the same basic model of downtown development favoured by the City for the last 50 years). The replica street wall on the upper storeys is fine, but I could do without the invocation of the brain dead York Boulevard-style signature phrase -- hermetic glass curtain wall, generic, anodyne labelling of building contents in meter-wide all-caps -- which signals nothing so much as utter indifference to context. Public Health will be split between the Health Campus & Robert Thomson Building, AFAIK. The department will be departing from the Right House (whose upper floors will become nearly vacant as a result). I wonder if the city could float the idea of "heritage bonds" to the BIA, to fund any adaptive reuse or teardown/replacement? With the idea being the amount would be repaid, if possible, to the bondholders over the next X years out of the revenue that the renovated/new building will generate. It would be a good way for the BIA to get their wish without looking to city hall to foot the bill for the upfront costs. It would be nice if the Sandbar building got redeveloped. I must say though that the parkette in that picture doesn't look that bad! if there was a couple of tables or benches and a garbage can, maybe some annual flowers in the summer it would be a nice place to relax with a beverage or maybe even have lunch. It's not as if there is a shortage of commercial space in the core these days... when that day comes the city could easily sell the green space to a developer with guarantees in place. The bottom line in my opinion is that something should be done with the Sandbar building sooner than later, in it's present state it is just an eyesore! Shame Thier + Curran Architects couldn't have a go with this property as they did with 95 King Street East Arts Centre and Lofts.. With more of the same concept in mind! Better to work with a shell than nothing at all..